When we started a genre study with grade 4 students the first question: "What kind of books do you know?" caused no problems to the students. Answers fiction and nonfiction came easily and fast as I had anticipated. Describing these two kinds of books was not hard as well. Real, realistic (keep that in mind), true and not real, made-up and fake:) were some of the adjectives used. That was when I started stretching their minds. What does it mean that nonfiction books are true? Showing a nonfiction books about aliens sparked a discussion on are aliens true and real. Many of the students decided that the nonfiction book we looking at must actually be a fiction book, because aliens are not real. That was just a start. The aim of the lesson was to introducing realistic (see above) fiction. I decided to read excerpts from "No talking" by Andrew Clements, When reading the summary of the book and getting to the part that the 5th grade boys at Laketon Elementary did not get along that well with the girls, and that the class was generally just very loud had some of the students make connections with their own class. True enough, as I had just had to ask the class to calm down as they had come to the library chatting loudly and singing. Not a bad thing to do in general but not necessarily when other library patrons are trying to study in the library. After reading the first chapter describing school life and antics of the main characters Dave and Lynsey I asked if these were real events the book describes, could these things really happen? The fictional Laketon Elementary is situated in New Jersey. And believe it or not I had a student from New Jersey sitting in the class, in Tallinn Estonia. 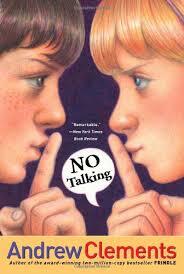 So the 4th graders decided that "No Talking" must be a nonfiction book. See what I mean by messing with their minds. I had turned their prior knowledge of types of books upside down. Wishing to do no more "harm" I introduced and explained realistic fiction to the class. I did not give the definition nor wrote down any descriptive words. I want the students to come up with their own explanation for the genre, and then look up the term in the dictionary. It was really fun lesson and interesting to observe and witness the active thinking happening in class. I'll let you know how grade 4 ends up describes realistic fiction. Next we will explore fantasy and biography. I am looking forward to inspiring conversations and insights from my grade 4 class.